Superheroes aren’t supposed to die. Yes, we know that they die all the time in the pages of comic books, but more often than not, they come back. But when we lost Adam West on June 10th, we knew we had just said goodbye to Batman. 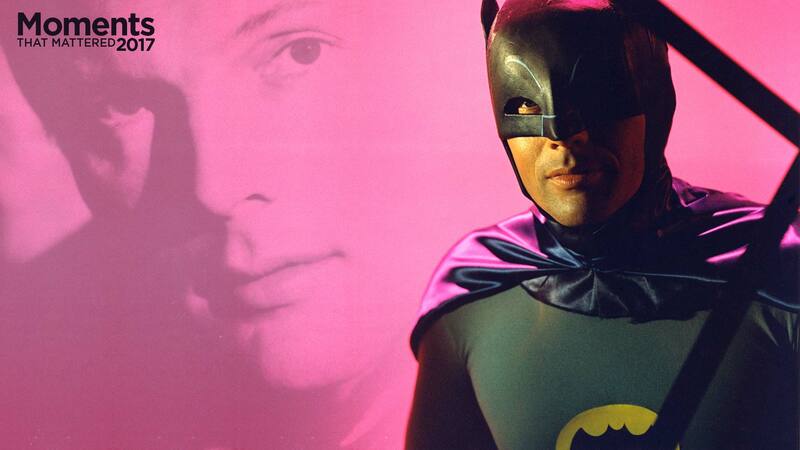 And make no mistake, for fans of a certain age, Adam West was Batman. Of this wave superhero camp, Batman stood head and tails above the rest, and so much of that had to do with Adam West. A working film and television actor when Batman producer William Dozier cast him in the title role, it was his charisma and 100% devotion to delivering over the top, often ridiculous lines to his allies and adversaries catapulted West and Batman into the zeitgeist. It was easy to see why. Batman had been around for over 25 years at this point, but we’d never seen him like this before. It was ridiculous, true, but the notion of a man dressing up as a bat to fight crime sans super powers has always been a little ridiculous. The Batman television series just realized this and leaned into it. Through all of the show’s craziness, West’s Batman always held his own, and more surprising he did it as the show’s straight man. He let his supporting stars like Burt Ward, Caesar Romero, Julie Newmar and Frank Gorshin go nuts and steal scenes. It’s been a common problem of Batman (in fact, of many superheroes) that the villains are often more fun onscreen than the heroes. While the villains on the Batman TV series were more over the top than West’s Batman, Batman always found a way to be fun. He had his own dance (the Batusi!) and carried shark repellant in his utility belt. He called people “chum,” and spoke enlightened about our “well-ordered society.” When he fought, giant cartoon sound effects filled the screen. Batman was the reason you watched, everyone else was just icing. Whether you were around when the show was airing or you discovered it in syndication years later, if you were a Batman fan born between 1960 and 1980, you’ve spent hours, maybe even days of your life watching it. When you pretended to be Batman with your friends, it was Adam West you were pretending to be. It was his costume you pictured and his colorful world you imagined entering. True, all of this changed in 1988 with the release of Tim Burton’s Batman movie, but West’s Batman never really went away. It was always there in the background. After over twenty years driving the car, it was only natural that it should take the backseat for a while, but it recently reemerged with the release of the show on Blu-ray, and West once again found himself talking about Batman. He was now in his 80s, but as lively and fun as ever. Sadly, it would all come to an end a few years later. Had West made it to his birthday this year, he would have been 89. That’s a great run, and it’s hard to make the case that he died young. But Batman, despite being human, is supposed to be immortal. He just goes on and on, for generation after generation. West may no longer be with us, but that doesn’t mean he’s not immortal. His Batman isn’t going to be forgotten any time soon. He’ll be remembered in the hearts and minds of fans for decades to come. There will be others who play the Dark Knight onscreen. But he’ll always be our only Bright one. Be sure to check DCComics.com again tomorrow for another Moment that Mattered in 2017.